As a dietary supplement, take two capsules twice daily. For best results, take one serving in the morning and another serving 30-60 minutes prior to exercise approximately 4-6 hours later. Do not exceed recommended dose of Slimvance® per day. Do not combine with other products containing stimulant, such as caffeine. Do not take before bedtime. See manufacturer's label for directions and ingredients., Consult your physician prior to using this product if you are pregnant, nursing, taking medication, or have a medical condition. Discontinue use two weeks prior to surgery. , ^These statements have not been evaluated by the Food and Drug Administration. This product is not intended to diagnose, treat, cure, or prevent any disease. *Use in conjunction with the diet and exercise plan available at www.slimvance.com/plan. †In a double-blind, randomized, placebo-controlled crossover study, 25 subjects exercised on a treadmill on two occasions. On one occasion, the subjects took the thermogenic 60 minutes before exercise, and on the second occasion, they took a placebo. When the subjects took the thermogenic, they burned three times more calories before, 3% more calories during and 12 times more calories for up to one hour after exercise compared to when they took the placebo. **A randomized clinical study of 140 healthy overweight people compared the use of Slimvance® in conjunction with an 1800 calorie diet and walking plan to a placebo with the same diet and walking plan. Those on Slimvance® lost almost 10 more pounds (-11.81 pounds versus -1.91 pounds), lost over an inch more around the hips (-1.76 inches vs. -0.48 inches), lost over an inch more around the waist (-2.12 inches versus -0.68 inches) and lost more percent body fat (-1.05% versus 0.71%) than the placebo group after 16 weeks. Combine with lthe conjugated and weight is getting manageable, thanx GNC FOR RECOMMENDATION ! As long as you continue to take this product things seem to be okay but if you stop everything you may have lost just came back on. That frustrating!! Be prepared to shed an incredible amount of water weight right from the start. Focus and energy during workout is noticeably better. Too early to comment on actual weight loss. Seems promising! I’ve been taking it for two weeks nothing has happened other than serious allergic reactions. Haven’t seen any results yet but one thing I do know is it curves my appetite and gives me energy. Go thermogenic or go home! I had to stop taking this because of the digestive upset it caused. They are difficult to swallow. I don't what it is, but the capsule is "sticky" and gets lodged in my throat. I don't know that I really received any weight loss benefit. Slightly curbed my appetite, but that's just the heavy caffeine. Just good old watching my food consumption and getting enough exercise is just as effective, especially for the high price. With exercise and CLA’s I was able to lose 30 lbs in three months. I took it as directed. I also drank the lean shakes 1-2 times a day and ate a full meal for dinner. I’m still taking it and am still losing, slowly. I have 7 pounds to my target weight. Can I take this if my baby is 10 months old and breastfeed occasionally. This products works, it definitely gives you that energy burst. And limits your appetite. But you have to drink Lots of water. I was taking these while doing intermittent fasting, and it definitely helped on controlling my appetite. I lost weight but I felt that I lost more body fat than anything. Good product. I also been using it for 3 months straight. Bought this product, I lost 20 pounds in 3 months on it without any intense exercise routine. I absolutely recommend it. Great product, curbs my appetite and gives me energy. This product was highly pushed by the staff at the store so I tried it and found no benefit in it at all for weight-loss and/or as a fat burner. I tried the CLA + Carnitine instead and with the same diet and exercise saw very good results almost immediately. It is much better priced as well. All that these really did was give me energy because of the caffeine. I didn't notice any other improvements. Love this stuff. Best weight loss supplement on the market. Been taking it for about a year now and Lost 100 pounds so far. Now you still have to work out regularly or put the effort in but I didn’t change my diet and you can use it along with the Keto diet as well. I’m telling you. It really works just put the effort into it. Not impressed. Energy yes. But it also has a stimulant. And i do exercise. 10k steps perday. 8 to 10 flights of stairs. And bike 20 to 30 miles each weekend. Have not lost a single pound in 30 days. No changes in diet or exercise. This product took me from a 38 waste to a 34 in 4 months. With a decal diet and hard work in the gym a hr to 2 hrs 3-4 days a week. I lost 36 lbs in 2 1/2 months using slimvance,eating healthy , digestive enzymes and working out 30min-1hr every other day. This product can do it's part but you have to do yours as well. It really worked for me. Dropped 40lbs in 4 months without majorly changing my lifestyle. This product makes me jittery and I have yet to see the advertised 12x calories burned. I work out 6 days a week for at least an hour with plenty of cardio. My diet is satisfactory and I take it as suggested. I wouldn’t waste the amount of money it was on it again. Worked for the first 2 weeks then hit rock bottom... gained the weight back and not able to lose it. My eating habits were consistent. not for loosing the last few ponds! After reading the reviews, I decided to give this a try, however after 4 weeks on it haven’t lost any weight. I wanted to help with loosing those last stubborn 10 pounds but this didn’t do anything. This product didn’t work for me. I thought I would try since the reviews were not bad. Did not work for me. Unfortunately I did not consider the high effect of caffeine, after 21 days I do not see much improvement in my belly area.I recommend that you use the stimulant-free formula. A REAL PERSON! NOT AN EMPLOYEE OR PAID TO LEAVE THIS REVIEW..
two more bottles. I have tried lots of different products like Go Lean, Slim quick, hydroxy cut and honestly none worked. Slimvance is the stuff. I WAS NOT PAID FOR THIS POST! I DO NOT WORK FOR THE COMPANY! I AM A REAL PERSON THAT HAS NEVER LEFT A REVIEW FOR ANY PRODUCTS EVER! THIS STUFF WORKS! I wish i could afford the qhole line but its bills aroud here. ?? Thank you for this product I love it. I have been taking these for two months. I eat pretty good and have one cheat day a week. I do 1hr cardio 5 days a week and I have only lost two lbs. I decided to purchase my second bottle to give it a chance thinking that maybe taking it longer would make a difference but it didn't. I am very upset and out over $100. I really like Slimvance. It is working for me. I have been taking Slimvance with the caffeen, and a CLA for 7 months. I have went from a 4x to a 1x. I took a brake for a month I'm currently taking a cleanse. And when I complete it i will start back up again for round 2.wish I could post then and now photos. So you all could see. I have been using slimvance along with CLA religiously for the past two months. I have cut out rice (being from Hawaii that was hard). I list 11 pounds in the first 30 days. I began to go to the gym and lost 9 more pounds. This routine and supplement combo worked for me, but you have to find your own routine. It helped to curb my appetite and after taking a break for a week my appetite and intake has stayed the same as when I was taking it. It does help, a friend of mine is trying my routine see if it works for her along with these supplements. 17.5 lbs. I cut back on the carbs and took walks with my daughter in the evening. I feel great and I have more room in my clothes and can even wear some that have been hanging for awhile. Absolutely nothing happened. Might as well hv taken empty capsules. So far it’s been 3 weeks and I’ve lost 10 pounds. I’ve changed my eating habits cut out sweets I feel great! I’m glad I’ve invested in this. Let’s see what the next 3 week will result in! I recommend this product ! Can i take before my morning work out and then later in the day before lunch? Instead of the other way around like directed. BEST ANSWER: You can honestly take it whichever way it work for you best! I take mine before I go to work and after I get off work to head to the gym. when it says take 2 in am but not with other stimulants such as caffeine, does that include morning coffee ?!? BEST ANSWER: Slimvance has 200 mg of caffeine. Your cup of coffee has about 60 mg. So it all depends on your level of tolerance for caffeine. They're going to advise people not to take it with other caffeine because of our litigious society. So try it. If it gives you the jitters, maybe consider having your coffee first and take the Slimvance an hour or so later. I waited a week before I started drinking coffee with mine. I was a little jittery but nothing unreasonable. Does the caffeine version of SlimVance (thermo?) work better than the non-caffeine! BEST ANSWER: There is no added caffeine in either of the products. The plants used in the the product are a natural caffeine source . The thermogenic will make your core temperature rise so you burn more calories. I'm on synthroid for under active thyroid, is this a product I should use, or will it mess with my lab results? BEST ANSWER: Did this product work for you? I'm Hypo too? No problem! The product contains 3 organic compounds. Turmeric, moringa, and curry leaf extracts. That's it! It is finally proven to work based on how they synergistically combined the 3 compounds, and the concentrations of each. No worries there. Just be sure to pick either thermogenic (caffinated) or non stim. Whatever makes you feel more comfortable. We would recommend speaking with your doctor. Can you take this product if you have Thyroid issues? It depends on if you are hyper or hypothyroid. Check with your pharmacist if you are on medications or contact your physician if you aren't medicating. I have diabetes. Are there any concerns using this product? BEST ANSWER: I have taken for 30 days, my sugars have become more balanced and actually dropped to normal. I did diet change via eating consistently, more often and more protein. I was already working out 2 to 3 days a week. I have lost 10 pounds. Historically I never have been able to shed any pounds despite what I tried, so very excited and hope I will lose another 10 lbs this month. Can this product be taken with out exercise so to just take two caplets per day? BEST ANSWER: For best results, activity is recommended because that was what occurred during the study to yield the results they did. 10 pounds compared to the placebo, is nothing to joke around about, and that was with mild exercise and an 1,800 cal. diet. The supplement will surely still work if you're in a caloric deficit, but not as enhanced if one was exercising too. The jury is still out whether this works or not. I exercise everyday and have taken this for three weeks with no results yet. Has anyone had alcohol while taking this? BEST ANSWER: I have had a glass of wine once and awhile with my dinner. I take Slimvance with Caffeine in the morning and Slimvance stimulant free in the evening. Alcohol has not affected me in a negative way with these vitamins. Results will vary and your diet is the most important thing. Can I take this and the detox at the same time? BEST ANSWER: I personally wouldn't take this product and detox at the same time because it might be more stressful on your organs and wouldn't get the best result. I would take a break from the product to detox and resume after. I don't see why not. I take a light detox daily. Can I take this if I’ve had a past of ADHD?! BEST ANSWER: Yes, It works for Me. Can this be taken while nursing a baby? BEST ANSWER: I definitely wouldn't recommend taking any supplements when nursing a baby. Stick to the same precautions you took while pregnant. No DO not take this which nursing. Can I take this on an empty stomach or do I need to eat first? you may have to take 1 in am then 1 in afternoon. to see if you can handle it. I became more regular after using it just after day two. Its the Magnesium Stearate Vegetable Source b.k.a.”the flow”. I was going to purchase this but then read the ingredients and I can't tolerate moringa. It causes me to break out in hives. Has anyone else had this issue? BEST ANSWER: Yes, it only happens every once in a while. It feels like I am getting hot, and then I will break out, but then it goes away in about 15 minutes if its even that long. Does slimvance affect hair loss? Can you take this if your doing intermittent fasting? BEST ANSWER: Yes, it actually limits the feeling of hunger. Do people have jitters from this product? Or heart palpitations? Can I take this while on 15mg of Phentermine? BEST ANSWER: I have been in phentermine before and I would not take it with Slimvance. I've had gastric bypass surgery years ago and need to lose 15lbs. Will work for me? BEST ANSWER: I have been consuming Slimvance Core Slimming Complex since December 2017. I have never ungone a gastric bypass but I do believe this product will assist in your goal of losing 20lbs. I have personally lost over 20lbs since I have been taking this product. Please note: I eat within moderation and I exercise 5 days a week. Why do face burn after taking? BEST ANSWER: A Niacin flush is caused from taking Niacin in large doses. This is caused by the capillaries closest to the skin and causes a tingling sensation. Flushing usually occurs after 50mgs. BEST ANSWER: I take 1 in the morning and 1 in the afternoon. This seems to work best for me. but doesnt say to take 2 in the morning and 2 in the evening? Take two capsules twice daily. 4 in total. 4 a day. 2 in the am and 4 hours later. when i don’t have time work out. i drink slimvance , slimvance work for me? can i loss poud? BEST ANSWER: For me it has worked best while working out. I don't have the time everyday. I have been taking for about 2 months now, and I have lost 24 pounds. 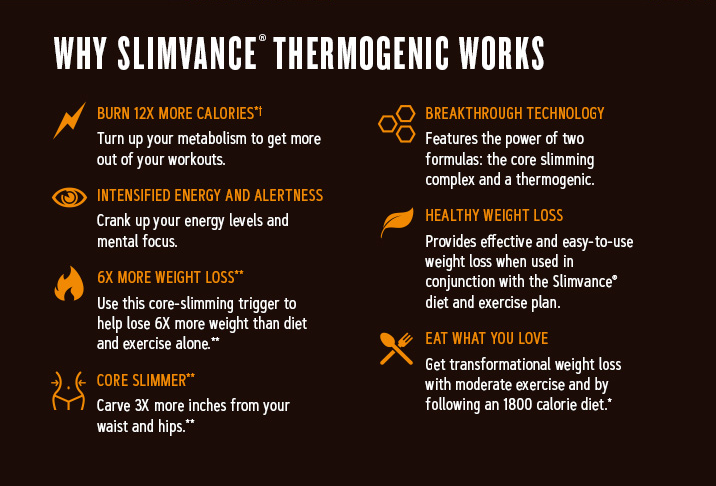 Slimvance works best with a diet and exercise program similar to what is found on slimvance . com. You will lose weight without working out but it does take quite a bit longer. This is true for any supplement you choose. 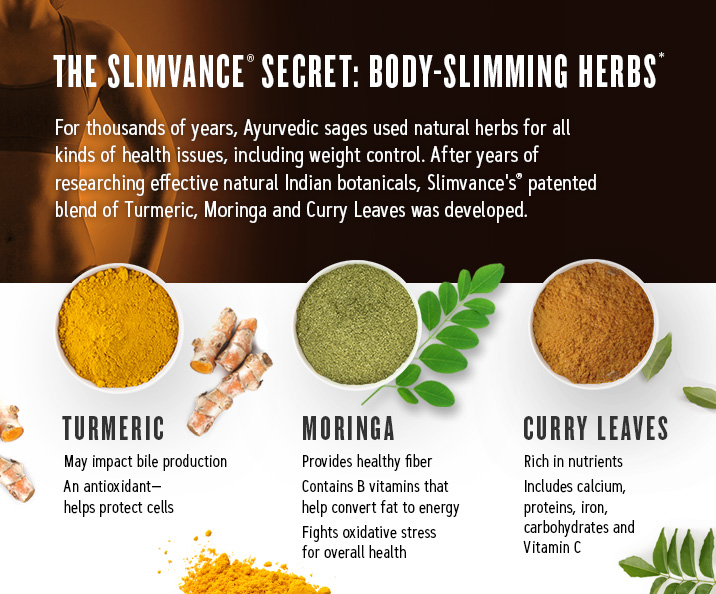 I like Slimvance because of the Moringa and Turmeric in it. Yes you will lose the pounds. Take it as directed and it works. Drink lots of water. Can I take this on non gym days? BEST ANSWER: I take it every day. Does anyone get a headache with this ? Can you you take slimvance along with waterex elite? BEST ANSWER: You can take it with anything, because it doesn't do anything. Can you take product if on mao inhibitors or anti depressants? can you take this if you taking wellbutrin? You say not recommended- did a doctor advise this or does it cause other issues or lose the effectiveness to the wellburtion? Can I take this if I have gastritis? I.e Im not supposed to have caffeine or any NSAID. BEST ANSWER: I would actually resort to the stim-free version of the product if that is the case. That should give you no problems or interfere with your condition. Since the supplement contains caffeine, you should not. Consult with your doctor. Anyone with PCOS (polycystic ovarian sydrome) use this? How did it work for you? BEST ANSWER: Consult your physician prior to using this product if you are pregnant, nursing, taking medication, or have a medical condition. I have PCOS, it helped me lose weight I had struggled to loose over years. when do you take capsules ? BEST ANSWER: As a dietary supplement, take two capsules twice daily. For best results, take one serving in the morning and another serving 30-60 minutes prior to exercise approximately 4-6 hours later. Do not exceed recommended dose of Slimvance® per day. Do not combine with other products containing stimulant, such as caffeine. Do not take before bedtime.